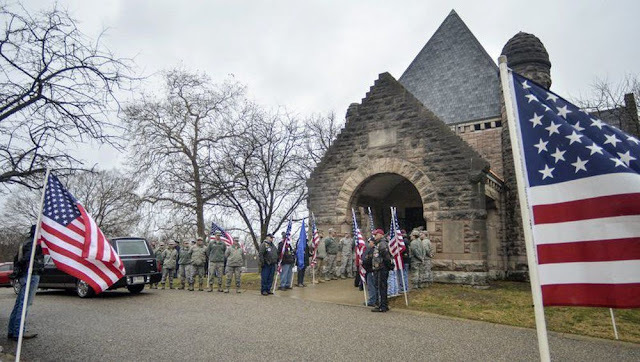 Terre Haute, IN (January 29, 2019) VRI — Dozens of active military and veterans paid respect to an American hero buried Monday at Highland Lawn Cemetery in Terre Haute. Retired U.S. Air Force Maj. Gen. John E. Taylor Jr., 95, lived about seven years in the Terre Haute area when he was stationed at the Indiana Air National Guard base at Hulman Field after World War II. He met and married wife Barbara Bronson Taylor in Terre Haute, and he stayed connected to the community through the years. His daughter, son and grandson said a final farewell Monday afternoon during a committal service in the chapel at Highland Lawn. “We’re honored that all of the Air Force people came and we received such a nice honor guard, and my father received the respect we believe he deserves after serving his country for 41 years,” Elaine Greenwood said after the service. She said her father was interested in auto racing and “anything that goes fast,” so being close to the Indianapolis Motor Speedway and the Terre Haute Action Track was a bonus for him. His nickname “Jet” was more than a reference to his initials or his profession as a pilot. Taylor’s legacy in Indiana is well known, said Brig. Gen. Kip Clark, commander of the Indiana Air National Guard former commander of the 181st Intelligence Wing at Hulman Field. “I believe General Taylor epitomizes the Air Force core values,” Clark said, noting Taylor was an especially talented aviator. 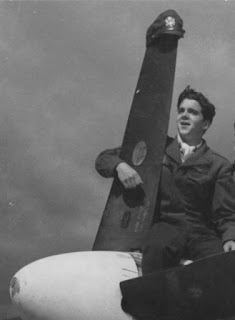 Taylor attended flight school and began his Air Force career in 1943 in Honington, Suffolk, England, flying P-51 Mustangs in World War II, according to his biography. The missions ranged from escorting bombers and dive-bombing and strafing targets to area patrol missions across a swath of Europe. After the war, he also few P-51s in the Indiana Air National Guard. When activated for duty during the Korean War, he flew the P-51, F-84 (Thunderjet) and F-86 (Sabre), completing 250 combat missions. At the end of the Korean War, he returned to Indiana, eventually transferring to an Air National Guard unit in Ohio to fly F-100 Super Sabres. As a lieutenant colonel, Taylor was appointed commander at Kunsan Air Base in Korea. He also few F-100 combat missions in South Vietnam. He later transferred to the Air Force Reserve as commander at Tinker Air Force Base in Oklahoma, and later was promoted to colonel, serving at Carswell, Tinker and Hill Air Force Bases. He achieved the rank of brigadier general and was later appointed major general. His medals and awards include Air Force Distinguished Service Award, Silver Star, Legion of Merit with two oak leaf clusters, Distinguished Flying Cross with three oak clusters, Airman’s Medal with two silver and three bronze oak leave clusters, Bronze Star, Purple Heart, and Air Medal with 13 oak leaf clusters. 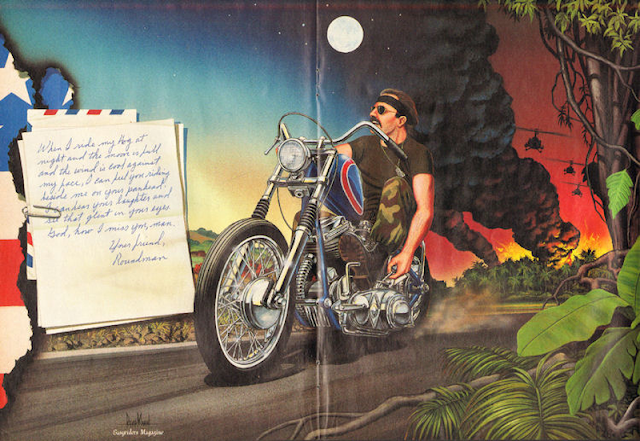 Taylor retired to his farm in Bluffdale, Texas in 1984. His daughter said he occasionally visited Terre Haute and the grave of his late wife. Presiding over the committal service was pastor Larry Spear, who recalled his own service as a pilot and an air traffic controller in Vietnam. “The F-100 pilots were some of the best pilots,” Spear said of Taylor, noting that his dates of service in Vietnam coincided with Taylor, so they may have communicated at some point. Spear said the number of service members and veterans who answered a community call-out and attended the committal service was large and impressive. General Clark said the respect paid to Taylor was well-deserved. 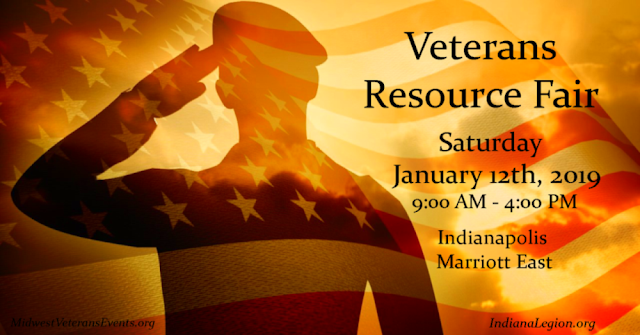 Indianapolis, IN (January 21, 2019) VRI — Veterans could get a state tax break. Governor Holcomb asked legislators last year to exempt veterans' pensions from state income tax. He's hoping to lure more veterans to live here as a way to quickly add skilled workers. The bill didn't go anywhere, but Holcomb is trying again, and legislative leaders sound more receptive. House Speaker Brian Bosma (R-Indianapolis) says a cost estimate of $14 million is less than it was the first time around. He says phasing in the tax break would cushion the cost further. Senate President Pro Tem Rod Bray (R-Martinsville) says employers across the state are complaining they have jobs they can't fill, and says the tax break is a creative way to bring in more people. Indianapolis Representative Karlee Macer (D) has introduced one version of the bill. Four others would exempt not only pensions but active military pay. That would nearly double the expected cost to $31 million a year. 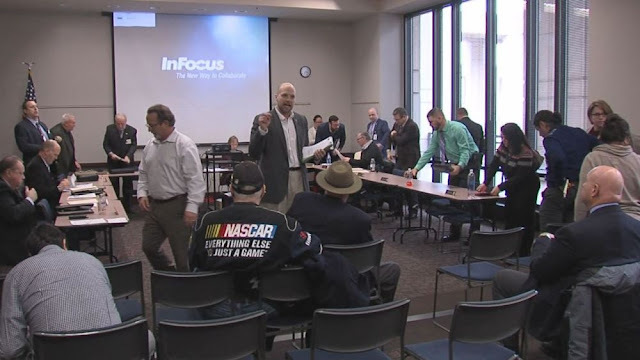 Indianapolis, IN (January 11, 2019) VRI — The Indiana Veterans Affairs Commission meeting ended in anger Friday afternoon as the governor-appointed panel decided not to accept public comment from veterans. The emotions boiled over as the commission and IDVA looked to correct several problems that have upset veterans in the state, including how the state helps veterans in need. 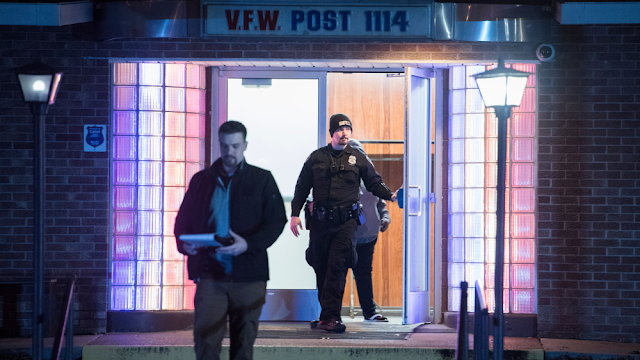 However, commission chairman Erika Steuterman said the meeting was running well past the two-hour mark, and she had allowed veterans to interject comments throughout, so she concluded the meeting without allowing public comment. “I know there's people who drove an hour, made arrangements for child care to be able to come to this public veterans commission meeting,” said veteran Lisa Wilken to the commission after the meeting. “It's very disconcerting that the public is not given the opportunity to speak to you." Veterans Lisa Wilken and Will Henry, the two veterans who blew the whistle with Call 6 Investigates back in November about misuse of the Military Family Relief Fund, spoke at the end of the meeting. 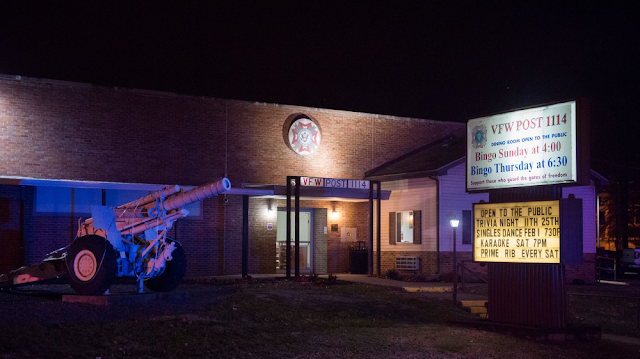 The commission and the Indiana Department of Veterans Affairs are both looking to make changes following a Call 6 Investigation into several problems within IDVA, including that the agency failed to adopt rules that could have helped homeless veterans and those with brain injuries. A scathing audit just released by the State Board of Accounts said the Indiana Department of Veterans Affairs and its oversight panel, the Indiana Veterans’ Affairs Commission, failed to adopt rules and written procedures for several funds. IDVA’s acting director Matt Vincent told the commission he had drafted rules that will help homeless veterans get services, and the commission and public will now have an opportunity to provide input on those rules. 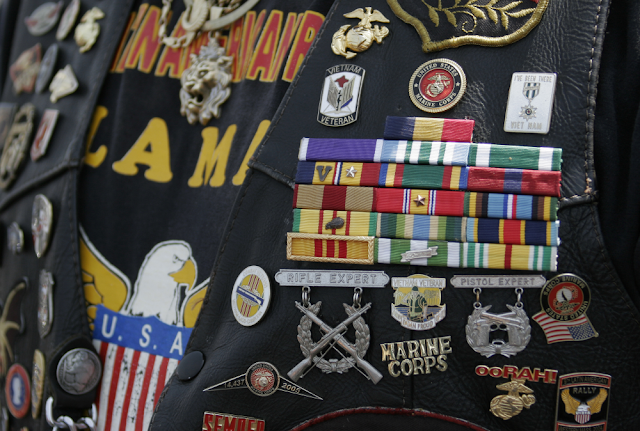 Vincent told the commission that the money meant to help veterans will not expire, although veterans Lisa Wilken and brigadier general James Bauerle both expressed concerned about losing the funds. The Indiana State Department of Health is currently finalizing an agreement with a provider for the state’s hyperbaric oxygen treatment program, which will help veterans with brain injuries. Call 6 Investigates also found IDVA allowed its own employees to receive benefits from the Military Family Relief Fund beyond the $2,500 limit as the agency denied other veterans. The commission discussed Friday whether it should use an administrative law judge (ALJ) to handle appeals for veterans who are denied. However, the commission did not make a final decision on how to handle appeals, so pending appeals will likely have to wait another three months until the next commission meeting, said Steuterman. 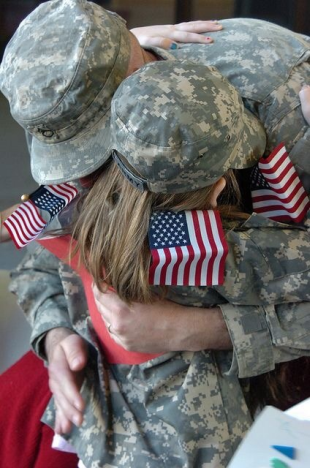 Just last week, the commission adopted new rules that stripped IDVA from allowing staff to approve veterans receive more than the $2,500 from the Military Family Relief Fund. Vincent said Friday the Attorney General and Governor had already approved the Military Family Relief Fund rules, and the rules will soon be published in the state’s register. The new rules say for a veteran to receive more than $2,500 through the Military Family Relief Fund, the case has to go through the veterans affairs commission, which will scrutinize each case individually. Former IDVA director Jim Brown resigned effective December 28. Steuterman said Friday a new IDVA director will be named soon and that interviews had already taken place. The commission’s next regular meeting will be held April 5 in South Bend.